Parasitic plants are some of the most mysterious members of the botanical world. Rather than photosynthesize like most plants, parasitic species latch on to a host and extract water and nutrients to survive. Parasitic plants are quite popular among horticultural enthusiasts because they have such unusual habits. Some are extremely rare and bizarre, such as the corpse flower, while others are exquisitely delicate and beautiful , such as the bird's nest orchid. Some parasitic plants are cultivated at botanical gardens for scientific study and to allow people to see some of the more rare and exotic species firsthand. Gardeners rarely grow parasitic plants because most need special conditions to survive which are not easily re-created in a garden. However, there are a few parasitic plants that are extremely common and can be found in almost any woodland. Scientists have classified more than 4000 species of parasitic plants, which obtain some or all of their sustenance from other species. All parasitic species have a special type of root that pierces the tissue of the host plant to extract water and nutrients. Root parasites live on the roots of other plants and appear to be growing out of the ground. Stem parasites grow directly on the branches of other plants. There are various degrees of parasitism. Some species can live out their entire lives without actually parasitizing another plant while others are completely dependent on their host. Those that are completely dependent on the host lack the ability to photosynthesize and are not colored green, but may be any number of other colors, often taking on a ghostly appearance due to the lack of chlorophyll. Interestingly, though parasitic plants are detrimental to their hosts, they rarely kill the host outright. Corpse flower (Raflesia arnoldii) is one of the most spectacular plants in the world and it is certainly the most dramatic of the parasitic plants. 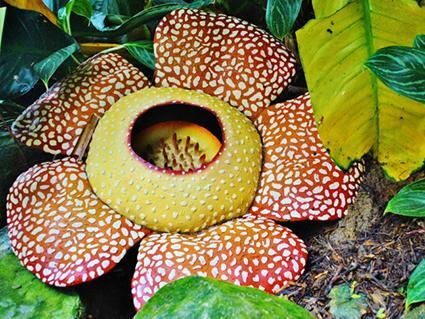 Measuring over three feet in diameter, it is the largest flower in the world and it stinks of rotting meat. Corpse flower is found in the jungles of Indonesia where it grows on the roots of a vine that is found in undisturbed rainforest habitats. This is definitely not one that home gardeners will be growing, but there is so much interest in the plant that tour companies have organized expeditions to take plant lovers on treks to see it. It is also valued as a medicinal product in Asian markets. One of the most notable things about corpse flower is its pollination mechanism -- the stench it emits attracts flies that would normally be drawn to carrion, who then inadvertently pollinate the flower when they come to investigate. If corpse flower is one of the rarest and most unusual plant parasites, mistletoe is one of the most common and ubiquitous, although gardeners do not typically grow it themselves on purpose. 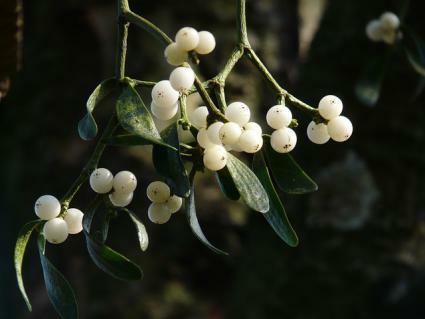 Mistletoe can be found throughout temperate climate forests where it is usually seen clinging to the branches high up in deciduous trees. Mistletoe is most apparent in winter when trees are dormant and has become part of Western culture as symbol of Christmas and something to kiss under. Mistletoe is green with white berries and is capable of photosynthesizing on its own in addition to what it gets from its host. Mistletoe berries are poisonous. 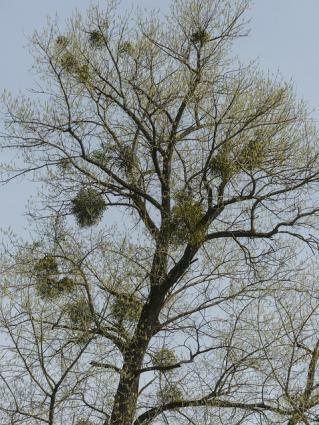 There are many species of mistletoe, many of which grow in large clumps up to three feet in diameter. However, one of the smallest varieties, called dwarf mistletoe (Arceuthobium spp.) which is usually found on conifers, is one of the most interesting. These tiny mistletoes build up pressure in their fruit capsules that eventually explode, projecting the seeds towards other trees at over 50 miles per hour. 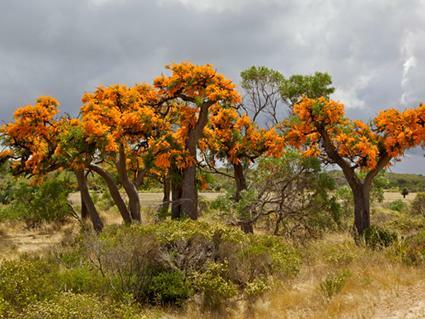 Australian Christmas tree (Nuytsia floribunda) is a distantly related to the common mistletoes that grow in trees all over the world, but it is found only in western Australia and it grows in the ground. Most parasitic plants are quite small, but this species grows to tree-like proportions -- up to 33 feet. It can be grown in cultivation, but survival rates are very low in a garden setting, so it is rarely attempted. This parasite does not restrict itself to a single host, but feeds off the roots of all sorts of plants that might be growing in its vicinity. Scientists have found that it reaches out to other plants up to 150 feet away to sap water and nutrients from their roots. Like mistletoe, it is a symbol of Christmas in Australia, as it typically sends out yellow flowers in late December. 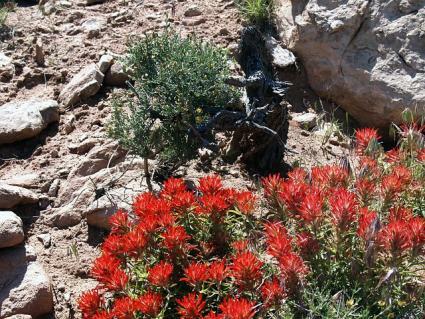 Indian Paint Brush (Castilleja spp.) is one of the few parasitic plants that gardeners sometimes attempt to grow. They are native North American wildflowers found in open prairies, often in thin soil around rock outcrops. They grow no more than 2 or 3 feet tall and and are known for their bright red flowers in summer. It is hardy in USDA zones 3 to 8. They are sometimes available as seed and should be sown directly with the plants that they typically parasitize, which are mainly native grasses. They are a short lived plant, but may reseed themselves voluntarily if conditions are suitable. Hydnora (Hydnora africana) is an extremely rare and bizarre parasite that, like corpse flower, emits the fragrance of rotting meat when it is in flower. They are pollinated by dung beetles. These tiny red plants are found in arid regions in southern Africa where they associate with a single species of euphorbia. The reddish flowers grow as a single appendage and look like the mouth of a strange sea creature. 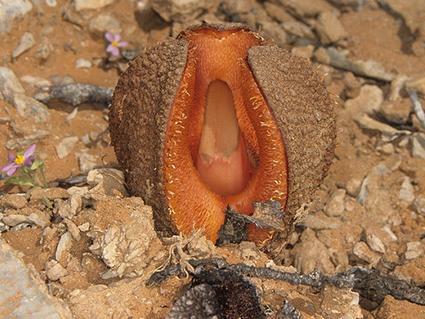 A plant collector from California once succeeded in bringing a specimen back and growing it under cultivation, but this is the only instance that Hydnora is known to have been grown outside of its native habitat. Broomrape (Orobanche spp.) is a large group of parasitic plants that are found throughout the northern hemisphere. They grow on the roots of different species and appear as tiny delicate flowers, usually growing no more than a few inches above the ground. They come in nearly every color of the rainbow and can be quite exotic-looking with an orchid-like appearance. 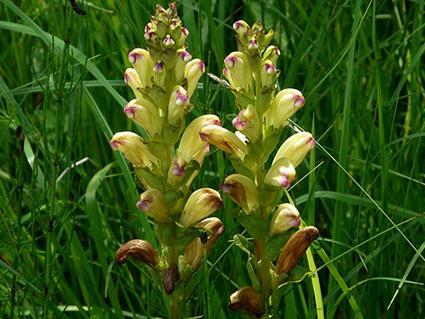 Like orchids, broomrapes are plants that botanical enthusiasts go out of their way to find the most rare and unusual species of. Some species, however, are very widespread and problematic because they use agricultural crops as host plants and are nearly impossible to eradicate -- not the sort of thing to try growing in the garden! 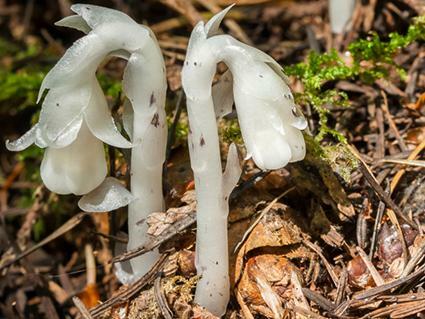 Indian pipe (Monotropa uniflora), also known as ghost plant, grows under coniferous trees throughout the northern hemisphere. It appears in clumps of pale white stalks about 6 inches tall, each with a single flower at the top. It does not produce any chlorophyll of its own, but derives its sustenance from the trees nearby. Interestingly, Indian pipe does not feed directly on the roots of the trees, but uses a fungus as an intermediary to transmit water and nutrients. Dodder (Cuscuta spp.) is a common parasitic plant found growing throughout the world. It grows as a twining vine throughout the leaves and branches of its host plant. There are many species of dodder, but all have spaghetti-like stems, which are sometimes found in bright yellow and orange colors. 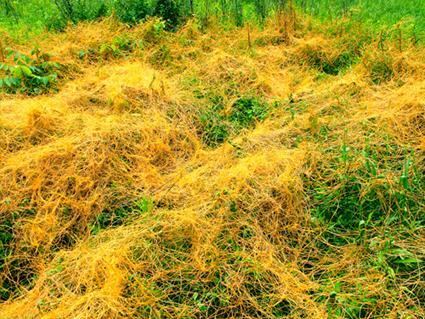 Dodder is considered a pest in some areas as it tends to smother its host plant, making it difficult to grow. So it's not something gardeners would ever seek to cultivate, but children have been known to harvest dodder and use it as fake hair in Halloween costumes. Witches hair is actually one of its alternative names. Parasitic plants are among the most interesting and unusual species in the world. They are not usually available as landscaping plants, but even if you don't have the means to travel to far-off place to observe them, there are likely a few species that can be found in the region where you live.